Portulaca, or moss rose, is an edible plant that grows in the Americas and northern Europe. There are close to 100 varieties of portulaca. 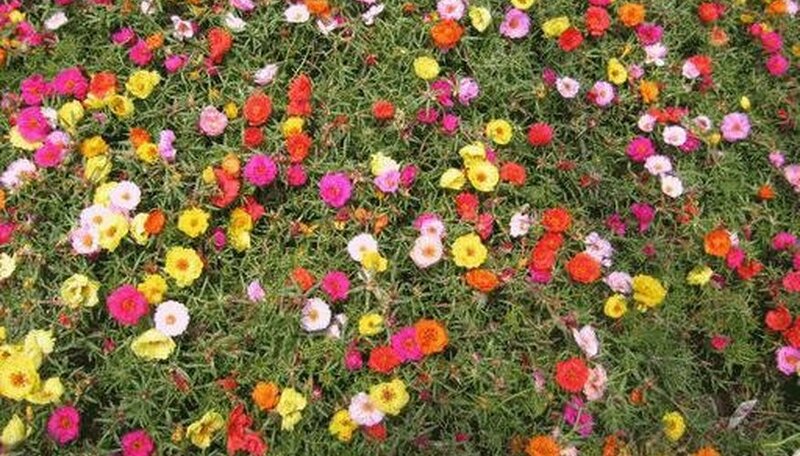 Portulaca makes for a great ground cover, sprouting multicolored flowers of pink, yellow, white, orange and red. The varieties grow anywhere from three to six inches high. Pick an area for the portulaca flower bed that has full sun for the majority of the day. Prepare a flower bed. Mix the soil with a sandy soil from a garden store if the soil isn't naturally sandy. Turn over the ground with a pitchfork so the soil is loose an aerated. If planting directly into the ground, dig a small ditch around the flowerbed and set in plywood so the portulaca doesn't spread any further than this. Follow the planting instructions on the portulaca seed packet. Generally, a thin planting that is lightly covered with soil is the best way to plant portulaca. Water the portulaca flower bed in early mornings or evenings, and only after the bed has fully dried out from the previous watering. Portulaca is best harvested before it flowers.